In order to work with the task list more efficiently and to get a better overview of a multitude of tasks, InLoox offers you several filter options. My: Shows all tasks that have been assigned to you, i.e. the tasks you are supposed to carry out. Project Participation: Shows all tasks from projects that you participate in whatever role (e.g. as project manager, team member, customer…). You can determine who participates in a project on the Management page of the project. All: Shows all tasks for which you have a reading permission. Today: Shows all tasks that are due today. Overdue: Shows all tasks that were due in the past. Open: Shows all tasks that have not been completed yet including tasks that are due today and overdue tasks. Completed: Shows tasks that have already been marked as done. 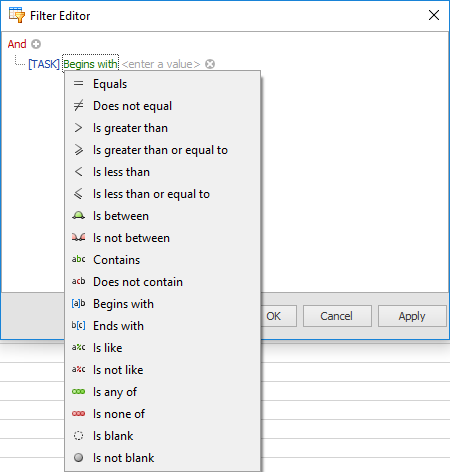 In addition to the filter options above, you can also use advanced filter options by applying the analytical filter. You’ll find the Filter button on the Home tab in the Current View group. Filter options in InLoox 9 for Outlook • Copyright 1999-2019 © InLoox, Inc. All rights reserved.